New Marvel Adventure Fantastic Four original art! Plus FF color guides! 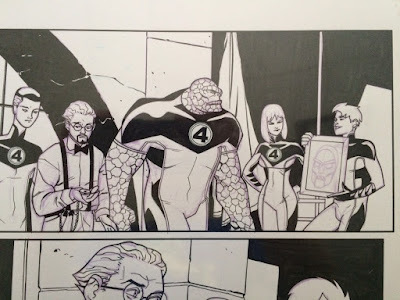 I picked up a couple pages from the enjoyable Marvel Adventures Fantastic Four series a little while ago - let's check them out! Both of the pages showed up on eBay at the same time, and I was lucky enough to get 'em both for a really good price! 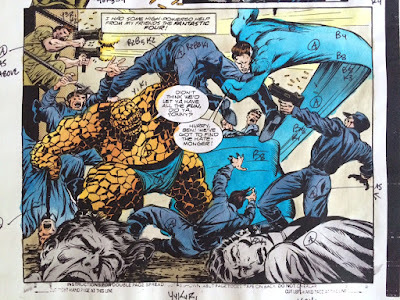 They're both by artist David Hahn from two different issues. The first page comes from issue 42, part of what I feel is a very underrated run, written by Paul Tobin. 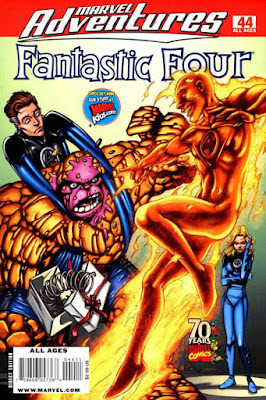 Marvel Adventures FF lasted 48 issues (plus a zero issue and an oversized special), making it one of the longest-running Fantastic Four spinoff series, behind Marvel Two-in-One, Marvel's Greatest Comics and Ultimate Fantastic Four, and you could make the case that those first two don't really count. 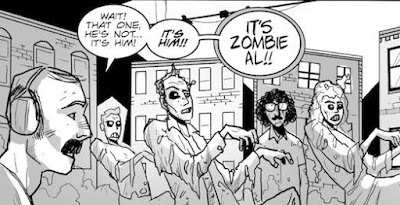 I got page nine from the issue. 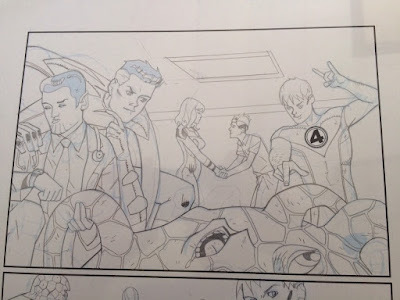 If you look closely at the line art, you'll see a purple hue in the background - the portrait of Dr. Doom that Johnny is holding is entirely in purple. 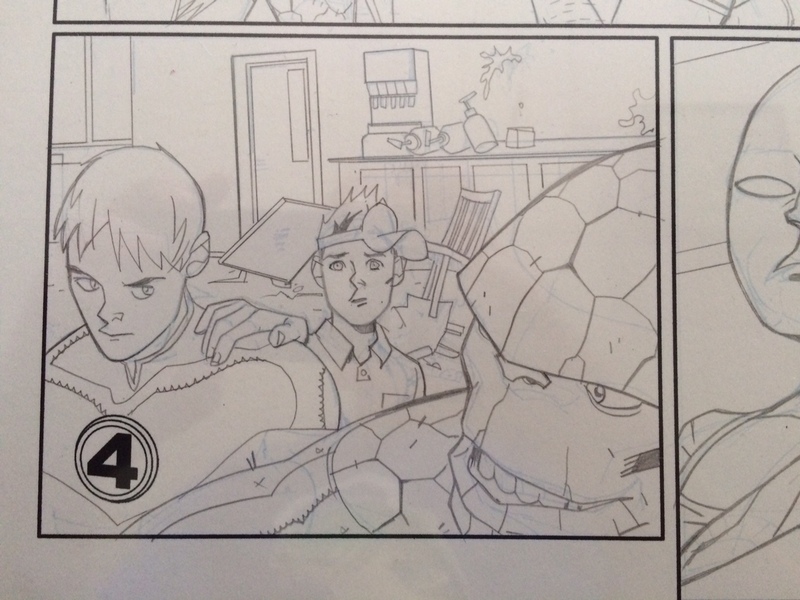 It looks like Hahn reproduced his rough sketch for the page, then pencilled and inked over it. You might also notice that the '4' emblems are all near perfect - that's because they're also printed out on the page as opposed to drawn in almost all of the panels. 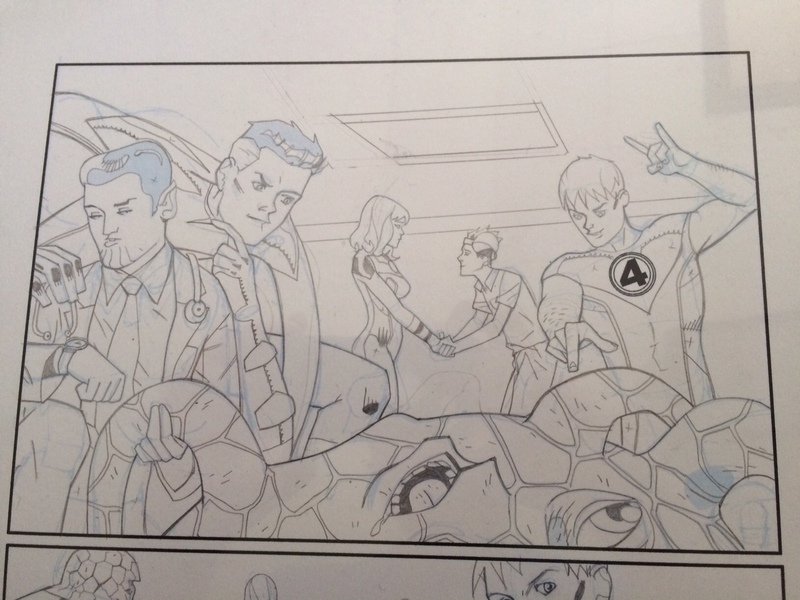 This is a great page with all four characters, plus even a little cameo by Dr. Doom! 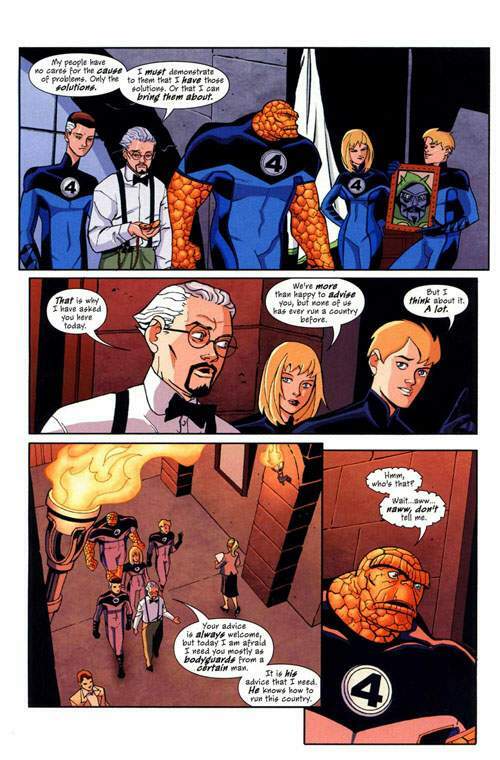 The next page comes from just two issues later - Marvel Adventures Fantastic Four #44. Here's the cover. Most Marvel books from this time period - and Marvel Adventure books in particular, had 'iconic' covers that didn't necessarily indicate what was going on inside the book. The thought was that Marvel would then use that artwork for other promotional purposes, killing two birds with one stone, so to speak. This directive lasted for a few years before they eased up a bit. Here's the page - the very last of the issue - as it appeared in its final form. 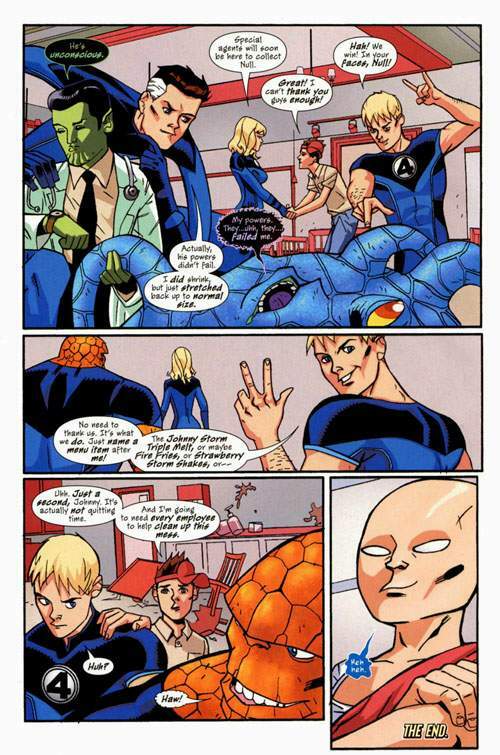 Not only do we have every member of the FF, but there's also a Skrull and Uatu the Watcher. This page also has the reproduced rough art, printed in a more familiar blue, but only pencils over top of that without inks. The pasted '4' emblems are back in this page as well. 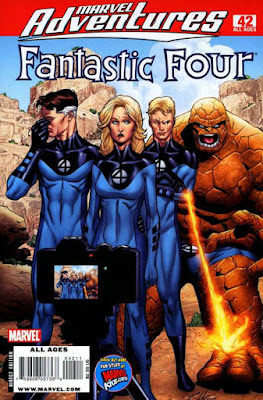 There are at well over a dozen Fantastic Four series and spinoffs, and I'd love to get at least a page from each of 'em. That's almost certainly never going to happen, but at least I can mark this one off the list. I also picked up some new color guides! These ones aren't from a Fantastic Four series, but they still feature the FF...so it counts. These three pages come from an oversized Fury one-shot from 1994. I wasn't even aware that this book existed before I bought the pages. 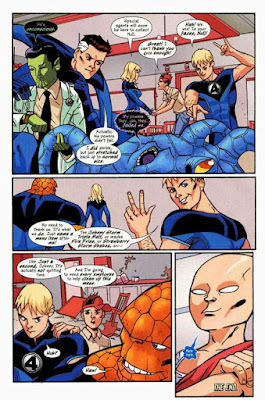 It's funny that the FF are in these pages more than Nick Fury himself, the star of the book. Here's a nice page with all four members...oh, and Hate Monger, who has the same face as Adolph Hitler. I think there was a time where it was thought that Hate Monger actually WAS Hitler, but that's since been pushed to the background, as it would not only be a bit implausible at this point, but it might not be in the best of taste, all things considering. Happy to add all of these to the collection.